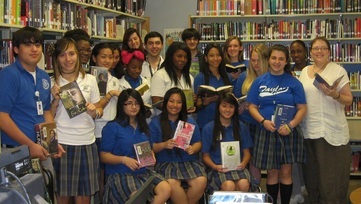 Bookmarked was asked by School Library Journal to contribute reviews of books for its bi-monthly newsletter, SLJ Teen. This stint began in June of 2012 and will end December 2013. 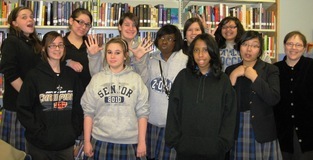 The editors at School Library Journal have raved about the students' book reviews. Open here, to read the reviews from each edition of SLJ Teen. One of the members of Bookmarked spends the summers with relatives in Chicago and got to spend a day with me at the ALA conference on June 27, 2013. You can read about our day and see pictures here. 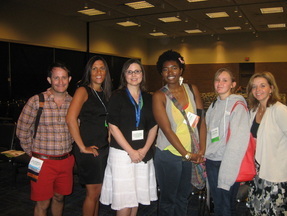 The American Library Association (ALA) held its annual conference in New Orleans in June of 2011. Members of Bookmarked were invited to speak on Sunday, June 26th at YALSA's (Young Adult Library Services Association, a division of ALA) committee meeting for the Best Fiction for Young Adults (BFYA). Each year the BFYA committee selects about 90 of the best books published for young adults. The members of the committee want the list to include books that the teens like, not just books that the librarians enjoyed. 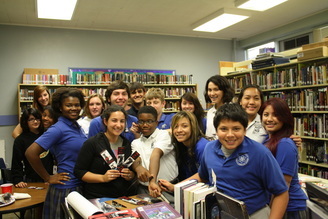 Authors, Jay Asher and Carolyn Mackler, spoke to the teens before the teens spoke to the BFYA committee. 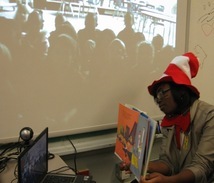 Students were asked to speak on any books that they read from the BFYA nominated titles. Some spoke once, others spoke multiple times. Lauren Myracle was blown away by the review one of our students wrote about her book, Shine. 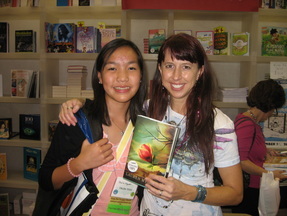 The author, standing on the right, met and signed books for all of the Taylor teens. 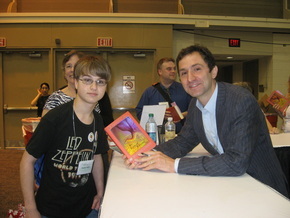 Jonathan Stroud, the author of the Bartimaeus Sequence talked to this student about his favorite books. Two students also attended the ALA conference on Monday, June 27th. 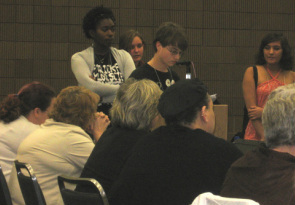 They were invited to join a 3 member panel discussion called, Trends in YA Services: Using Mobile Devices to Serve Teens. Jennifer Valesquez, standing third from the left, is a librarian from San Antonio. She began by giving statistics on teen use of social media and mobile devices. The other three librarians standing on the left and the right are Jack Martin, Kerrilynn Hurley and Renee McGrath from the New York area and shared programs that they designed especially for the their teen patrons. The students were asked to comment on their use of electronic devices for reading or research as well as their opinions of the programs. Read more about the session here. 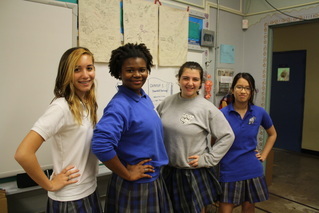 On June 14, 2011, three members of Bookmarked were interviewed on the New Orleans NPR station, WWNO. The students were talking about books, reading, and the American Library Association programs in which they are participating. You can hear the interview by clicking on the above picture. Click here to check out the book review blog from two members of bookmarked. 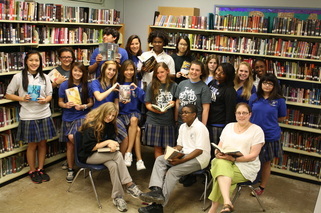 Bookmarked gathers for a group shot for the school yearbook. 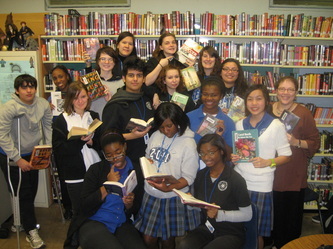 Who knew we were such an attractive bunch and avid readers too! Bookmarked has been selected to be one of 16 library book groups in the USA to read, review and select the 25 books nominated for Teen's Top Ten sponsored by YALSA, a division of the American Library Association. This appointment will last from 2010-2012. Click the box below for more information. Or read more here. 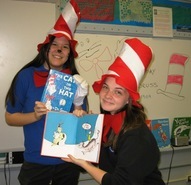 On March 1, 2010 members of Bookmarked read Dr. Seuss stories to students at Gretna # 2 and Pittman Elementary schools. 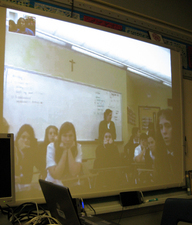 Instead of traveling to those schools to read, we used the computer and Skyped. Gerald McBoing, McBoing made some cool sounds! You can see the elementary students on the white board. We put the book near the camera so the kids would get a nice view of the pictures. 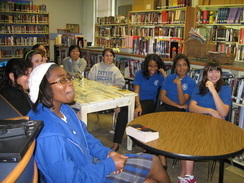 On October 16, 2009, the book group had a skype session with the book group at St. Scholastica in Covington, LA. We plan a reprise of this event in December. The photo below is what Bookmarked saw as we Skyped.